House Of Wonderland offer quirky, unique and pop art style designs from jewellery to art prints. HOW was launched by Tessa who is seriously hard working to make her brand succeed. I adore the uniqueness of HOW's pieces and wanted to share with you some of my favourite picks from their website. The 'You May Say I'm A Dreamer' art print captured my attention obviously because it's a song lyric of John Lennon's - and what a fab song that is. Priced at just £6 I think it would make a lovely addition to my room! My favourite pieces from HOW's collection is most definitely the range of necklaces. 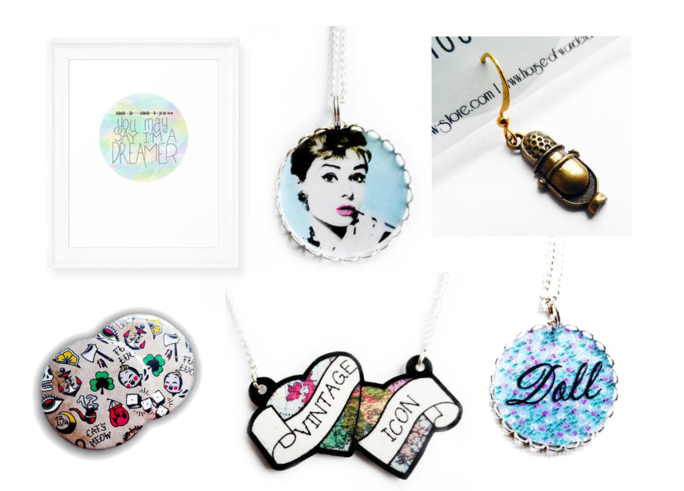 My favourite is the 'Doll' slogan one, you can see a wide range of necklaces HERE. Still on the theme of jewellery I thought that the Microphone Charm Earrings were so cute and show my love of music very well. They are part of the HOW Vintage collection which I am a massive fan of! And finally the brand offers a wide range of pocket mirrors with quirky designs, my favourite was the little bit different but so cute Lucky Tattoo design. I think House Of Wonderland is definitely worth checking out. Their pieces are unlike anything I have seen and would make a brilliant unique gift to yourself or maybe even someone else. You can see how much hard work designer Tessa puts into HOW as well! What do you think of House Of Wonderland? I love their stuff so much. I always look on there! Have you tried emailing them again? What a cute collection! I love Audrey Hepburn.